The best fishing & hunting tends to happen in conditions that would be considered less than ideal. Cold beer and a hot sun are a great combination, but it’s usually dark, raining, and there’s a cold wind that’s colder than the beer biting at you. That’s why having the best waders is so important. It’s one of the easiest ways to stay warm, stay fairly dry, and be able to catch your quota. In some ways, the best waders can only be found by trying them on. You’ve got to know how they fit, how they move, and if the storage built into them is easy enough to access. This chart will help you find the waders to try. The reviews that you find here are going to help you find some great waders, but the best fishing waders are the ones that work with you. Above anything else, your new waders must be breathable. If they are not, you’ll get wetter from the cold sweats that are going on then from the water trying to get into the waders. Think about getting waders that have materials, which are similar to Gore-Tex for the best experience. You’ve also got to choose from boot foot waders or stocking foot waders. Some of this comes down to personal preference, of course, but the stocking foot waders tend to be a little more versatile. You typically have a little more movement and flexibility with them. A final consideration in finding the best waders is to make sure they are as light as possible. The best wader reviews might talk about how dry some waders keep you, but if they weight a few dozen pounds, you’ll find yourself fatigued faster than needed and that can make for a premature end to a day of fishing. The best waders will help you do more than just enjoy a gray day at a mountain stream. Duck hunting generally needs to have waders on the equipment list as well. The best waders for duck hunting are typically chest waders because they give you enough flexibility and comfort for long moments of stillness in the habitat. They will also have storage placement in the chest area for your calls or other gear so they don’t have to get wet. The best waders can also help in other tasks. Farmers might use waders to stay clean and dry on a wet day in the fields. Others might use waders for clamming. As long as they are comfortable, flexible, and breathable, they’ve passed the first test. Then there’s the price to consider: the best waders are typically about $100, give or take a little on either side. What is nice about these waders and why they’re the best foot waders is the fact that they are reinforced in just the right places. With double knees and breathable gravel guards, these waders work great in virtually any weather condition and will help to keep you warm. It’s made with a polyester outer and proprietary technology on the inside that helps to wick away sweat without letting the water come in to make you clammy. The feet are glued, stitched, and double taped to help keep the moisture away from your legs and feet as well. For those extra cold days, the best waders are going to be insulated perfectly so that you still stay warm. That’s what is nice about these food waders. Not only do that have 200gr Thinsulate insulation built into them, but there’s a 3.5mm layer of neoprene included as well. The kneepads are reinforced and the chest pocket is lined with fleece in case your hands are getting cold. The high bib design provides an extra layer of protection and the cleated outsoles are a nice final touch. Although these waders sit a little low on the body, there are still some great things about them that make them one of the best waders available right now. The top feature is the 3 layers of DWR coated fabric that are virtually guaranteed to help keep you dry. There are integrated gravel guards with a hook and the flip out pocket is definitely useful. There are belt loops built into the waders as well and a wading belt comes with the waders out of the box. The opposing buckle system can help make these waist high waders if that is your preference. They definitely work! The stocking foot design is a little more flexible, which makes these neoprene waders from Caddis Wading Systems one of the best fishing waders available today. With double stitching, tape, and glue, there is a size that works with virtually every body type and size in this line of waders. 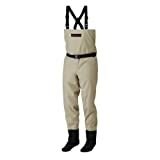 These are high chest waders, so not everyone is going to like them, because they fit more like a pair of coveralls. Overall, however, they are extremely comfortable, have sliding gravel guards, and the hand warmer pocket is actually big enough to fit your hands into it without difficulty. These are great waders at a great price. If you’re looking for a basic set of waders that will help to keep you nice and dry and are on a budget, then these might just be the best waders for you. They’re made from a nylon fabric and have a PVC laminate that helps to give a little extra-added protection. The wading boots are built into the waders, as are the suspenders. A draw cord around the top helps to keep everything snug and tight. They’re not fancy, but they work and it’s difficult to argue with that. The best waders should be comfortable, but flexible, and be breathable. By using the reviews here and taking these tips into consideration, you’ll be enjoying the best waders for fishing, duck hunting, or your preferred need today.